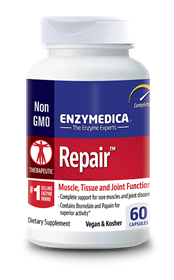 Repair contains a blend of protein digesting enzymes to support muscle, tissue and joint function. The formula includes protease, bromelain, papain, and catalase in a new targeted release capsule to ensure optimal delivery. Capillary blood flow plays a major role in the healthy inflammatory response. These small blood vessels are responsible for carrying oxygen and nutrients to the cells and removing waste. After an injury some of these capillaries may be damaged, making them incapable of carrying fluid to and from the damaged tissue. The result is pain, swelling, redness, heat and loss of function. In studies [proteolytic enzymes have been shown to support healthy circulation and speed healing. Proteases may also stimulate phagocytes (cells that ingest foreign particles and debris) and accelerate elimination by way of the lymphatic system. In a recent study, runners were given protease supplements or a placebo four times a day for three days. This consisted of 24 hours before and 48 hours after running. The participants were evaluated for mood, muscle soreness and pain threshold 24 and 48 hours after running 30 minutes at about 7 miles per hour. The result was a decrease in soreness, improved pain threshold and no mood change with those taking the proteolytic supplements over the group who took the placebo. According to some sports medicine reports, top athletes in Germany utilize enzyme therapy, and in Australia, athletes are provided with enzyme capsules as a precaution to aid in rapid recovery after injury. For thousands of years the body has protected itself from life threatening illness and injury through the often misunderstood inflammatory process. Healthy, beneficial inflammation is occurring at all times at low levels for the healing, repair and cleansing of the body. Proteolytic enzymes play a major role in this process. Proteolytic enzymes are manufactured by the body to break down proteins, both in the digestive system and systemically in the bloodstream. Repair contains a blend of protein digesting enzymes to support muscle, tissue and joint function. Repair may be taken before and after strenuous exercise to speed recovery. Support for Muscle, Tissue and Joint Function.